renal tsar's blog: Why real life needs real trials? Why real life needs real trials? 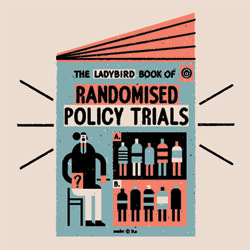 I have often thought that if only politicians and civil servants had a “How-to-book of randomized policy trials” there would be a better understanding of the roles scientific approaches can play in setting policy goals and improving care. I need wait no longer. The rational and power of randomized controls trials has now been laid out in a short paper as a result of a collaboration between two academic experts, Professor David Torgerson and Dr Ben Goldacre, and two civil servants, Laura Haynes and Owain Service, of the cabinet office’s behavioral insights team. Randomized trials are important in policy work for exactly the same reason that they are important in medicine; because our theories about what works are often badly wrong, and in a complex world it is often only a properly controlled trial that will set us straight. In the Test, Learn, Adapt: developing public policy with randomized control trials. Might sound a little bit of a mouth full, but it’s a short and easy read. It debunks a lot of myths, provides a simple how to guide and gives several examples demonstrating how randomized control trials can make drawing conclusions from new policy vastly simpler and more robust. Tim Hartford, the undercover economist, in the financial times even waxed lyrically about the paper and commented that the culture in government often has little knowledge of or respect for basic scientific methods. What matters is what works. But finding out what works is a serious business. Hopefully, test, learn and adapt will become part of the reading list for fast stream civil servants and members of parliament.